Face it, we all hate waiting at the lights on Dunmore Road to cross the TransCanada, waiting to turn left onto 15th Street SW by the Husky, and to a lesser extent, turning left onto 7th Street SW by the Callaghan Inn. I have seen many accidents at the Dunmore Road / TransCanada intersection and a few along the TransCanada through town. So why not just turn all these intersections into overpasses? It might cost a lot of money, but I would not rather see the aggravation of fellow drivers while they are waiting followed by them getting slammed by an 18 wheeler. Even one would probably relieve a lot of traffic congestion. Although that might increase the congestion at other intersections. 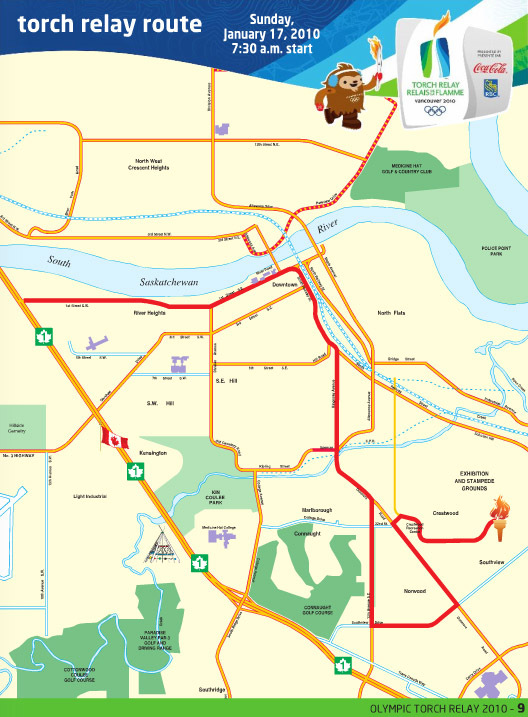 Unless we are willing to rename Medicine Hat from “The Gas City” to “The Vehicle-Emissions City” and let motorists idle for 5-15 minutes, especially driving to Walmart on a Saturday or Sunday, I think it is time a solution was created for these intersections. With the recent rain fall, Medicine Hat and Cypress County Emergency Management staff are monitoring the water levels in the region. A High Streamflow Advisory has been issued by Alberta Environment for the South Saskatchewan River including the City of Medicine Hat. This means that stream levels are rising or expected to rise rapidly and no major flooding is expected. Minor flooding in low lying areas is possible. Anyone situated close to the streams affected is advised to be cautious of the rising levels. The Medicine Hat Community Celebration Committee is finalizing plans with the Vancouver Organizing Committee preparing for the arrival of the Olympic Torch. 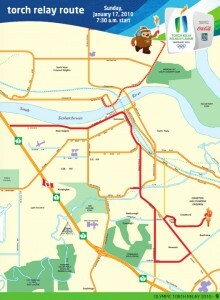 The Torch Relay route for Medicine Hat on Saturday, January 16th begins at 16th Street S.W. at approximately 6:00 pm and arrives at the Saamis Teepee Site at 7:00 pm. An outstanding celebration will be held at this site from 6:00 pm to 8:00 pm with Terri Clark being the featured entertainer. 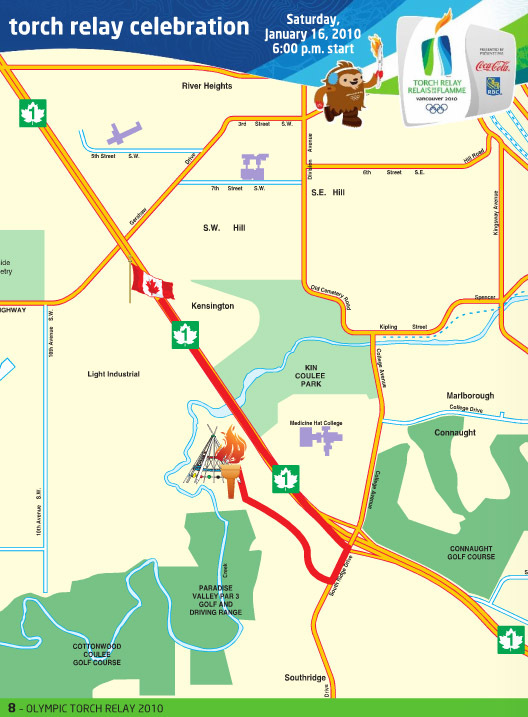 The Torch Relay Route for Medicine Hat on Sunday, January 17th, begins at the Cypress Centre at 7:30 am and reaches the outskirts of Medicine Hat on the Trans-Canada Highway at approximately 8:47 am. The Chair of the Medicine Hat Celebration Committee, Jeremy Thompson at 403-581-8098 or Project Manager, Frank Merkl at 403-502-8599. So, there I was, merging onto the #1 from the overpass by The Medicine Hat College. There was a police officer next to me and as I began to merge he was not slowing down or speeding up to let me go in front or behind him. So I tapped the gas to get in front just as he begins to go into the right lane to go onto 13th. He pulls back and turns his lights on, drag. I was not speeding by enough to warrant a ticket, so what else could it be? He says “You did not signal”, which is like impossible (like as in, one in a billion amount of times I will forget it, since I am a very signal, mirror, shoulder checking type of person – usually). Although in thinking back, I did not see him signaling, but whatever. He checked my signal light, and it was working. So in the way that funny stories go, he says “You have a nice car”. Oddly enough, I have been pulled over so rarely that it is years in between, and despite having probably the most recognizable car in Alberta/Saskatchewan (probably), it has never been the reason I have been pulled over in the past. He checks my insurance and it turns out that it is out of date. Double drag. But he calls it in and of course it is valid. He seems to be a good guy about it and polite as well, and not a jerk, something most people would contrarily attest to, and not without warrant, because usually cops seem all too happy to write out some tickets as opposed to realizing people are fallibly human. This one time I was going like 7kph over the limit at 11pm on Highway #3, got pulled over, cop asks why I was speeding, I said “I do not have cruise control and sometimes my foot eases on and off the gas ever so slightly”. Apparently that is not a good reason, and 7kph over on the loneliest of roads is a hazard to everyone around me. He comes back to my car, we talk a bit, and in saying I am from Saskatchewan and only recently changed my plates over to Alberta plates. Insurance is way different there, which he agreed with and even said he liked Saskatchewan’s system better (diss to expensive Alberta insurance), he did not give me a ticket for either offense. Long story short, most of the time police officers seem to hand out tickets without reason other than “because”, but sometimes it is not entirely a bad experience.